In part 1 of this article, I mentioned one tree damage that resulted from typhoon Glenda's wrath. Continuing our morning walk that day, we also saw this tree that fell on a community basketball court. Prior to this incident, I didn't notice this particular tree in our daily morning walks. There were just too many trees in this area, some owned, some just grew where they were. This one didn't seemed to be owned because it was near the community basketball court. The tree fell and grazed and broke a coconut tree on its way down. You could see the coconut tree behind it. Half of the coconut is still standing while the top half is still drooping. There's something peculiar though about its trunk as detailed in the photo below. 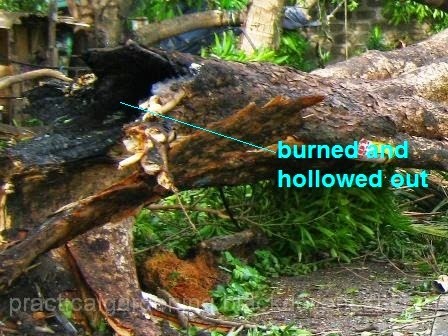 Notice how the trunk near the base has been burned and hollowed out. I'm assuming that this situation has thinned and weakened the base of the mango tree through the years. Top heavy and a hollowed out trunk base, what tree wouldn't topple with strong storm winds? My theory is that the tree burn resulted from burning yard trash at the base of the tree. It is likely that on a hot sunny day, someone swept yard trash (dried leaves and garbage) and decided to incinerate all these under the tree's shade, at the base of the trunk. Left unattended, the incineration caused the burning of the tree side. This regular practice of incineration eventually carved out the tree's trunk. The tree didn't hit a house, but its top branches hit a car. You can see the dent on the side panel and roof, as well as the shattered windshield. The owner was still busy clearing the tree's branches when we passed by. On our way back, we passed by our neighborhood chapel and this is what we saw. Another tree, this time a Camachile, fell - barely missing the chapel. This is one of those old majestic trees that have become memorable landmarks since we moved here. We would attend masses under its shade decades ago. Again, notice the detail on the base of its trunk. Apparently, this tree suffered the same fate as the mango tree. Blackened and burned and hollowed out, the weak base had to give. I seriously doubt if the gardeners or those disposing yard trash were ignorant of what they did to the tree. My second theory is that they intentionally dumped burning or burned yard trash inside the hollowed out space in the trunk so that; trash can continue to burn completely; and the burned trash would settled inside and not be blown by the wind. We too occasionally burn yard and garden trash but we do that in a homemade garden and yard trash incinerator. This practice of burning garden and yard trash at the base of trees has to stop. The damage it does to trees in the long run is something that cannot be taken for granted.